I go through phases with Etsy, some months I browse daily and other times I won't log in or visit for long periods of time. Right now I'm pretty obsessed and find it a great place for creative inspiration and ideas for the home (especially as most of the beautiful homeware and furniture shops are never based in the UK... $89 dollars for shipping can really put a girl off that beautiful lamp). 2. Black Marbled Cement Pots - More plant pots! Completely different to the cutesy cat pots but I'm totally on board with this concrete homeware trend right now and I love the marble effect. 3. Cocoa Butter Soap - I've wanted to order something from Ravenscourt Apothecary for so long now but simply haven't been able to justify purchasing more soap... until now! We're finally out of bar soap in the bathroom & this cocoa butter bar sounds yummy as it contains cocoa powder too & we all know I'm a chocolate addict! 4. Concrete Diamond Necklace - I rarely wear jewellery but when I do I prefer long necklaces like this. This is so unique for a necklace... it's concrete! & I love the gold leaf on the bottom too (you can have silver too) for a little added sparkle. 5. Chunky Knit Blanket - Finally, something not necessarily appropriate for spring's arrival, but if you're cold-blooded like me a good blanket is always handy. This is more decorative really and runs the possibility of having the cat claw it to shreds but I want it all the same (if only I could knit). 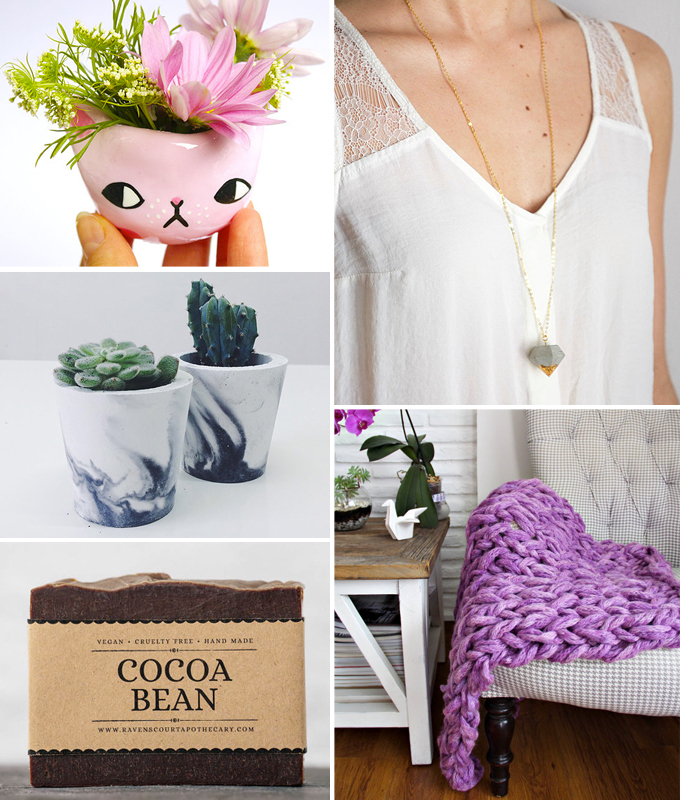 Are you an Etsy addict?